Digi-Schlock: WITHOUT WARNING (Scream Factory Blu-Ray) – Schlockmania! For years, Without Warning was one of the titles that disappeared into the kind of availability vortex created by ownership rights tangles, never making it to VHS or DVD in the U.S. and becoming a hot item on the bootleg circuit via dupes made from foreign videotape releases. Its profile was raised in recent years thanks to a new HD master that unexpectedly popped up on MGM’s HD channel – and that profile can go even higher now that Scream Factory is finally making the film available in a blu-ray/DVD combo pack. The results not only look good but are given the kind of special edition love this label loves to offer to this sort of cultish obscurity. Things start off with a swell HD transfer, presumably the same one used for MGM’s HD broadcasts. It does well by Dean Cundey’s cinematography, offering plentiful detail and color to its natural-light visual approach. The night photography in particular benefits from the high-resolution bump, especially on the blu-ray. The 2.0 mono soundtrack is presented in DTS, lossless on the blu-ray, and offers a solidly mixed blend of elements that offers a nice depth to Dan Wyman’s synth-tinged score. There is also a special edition’s worth of extras on this release for fans to explore. The bonus material begins with a solo commentary track featuring producer/director Greydon Clark. 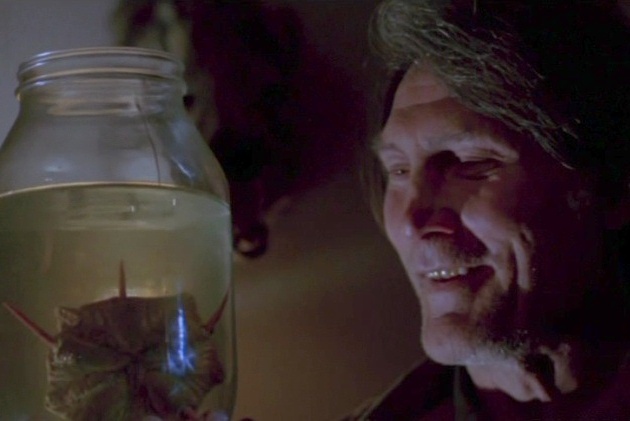 His delivery is low-key but his memory is sharp, resulting in a track packed with both scene-specific information and thoughts on bigger themes, particularly his fondness for Jack Palance and his willingness to work hard on a low-budget film. 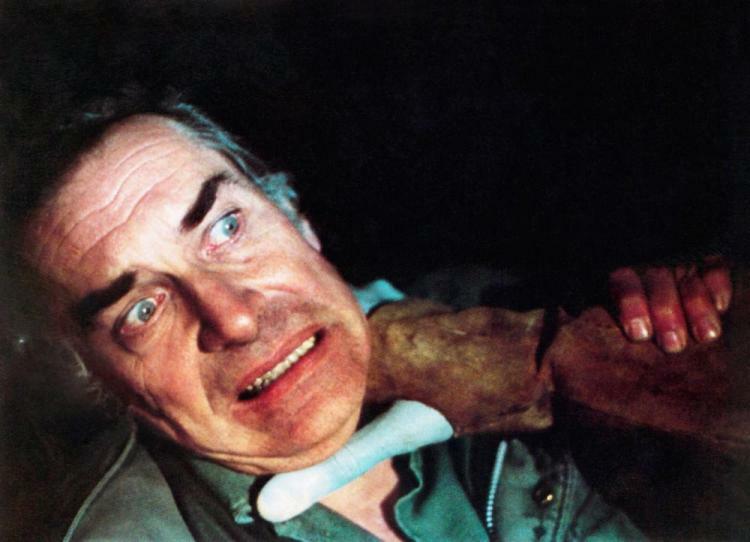 You’ll learn how an actor’s injury was worked into the story, how Clark ended up doubling both Palance and Martin Landau for one shot in the film and the tortured tale of the film’s hit-and-miss distribution. The comments slow a little bit near the end but you’ll walk away from the track feeling that Clark shared everything worth knowing about the film. A quartet of interview featurettes follow. The first features stars Christopher Nelson and Tarah Nutter. Both reveal how they got into the business, offer their impressions of their older castmates and discuss their reactions to the film. Nutter tells a fun tale about how her scream decimated a shack set during one sequence and Nelson tells a great story about a narrowly averted dust-up during one scene between Palance and a young David Caruso. The next interview features producer Daniel Grodnik, who talks about how he developed the script – including how four different writers ended up credited on the piece – and talks about his early career, including how he got the idea for Terror Train. 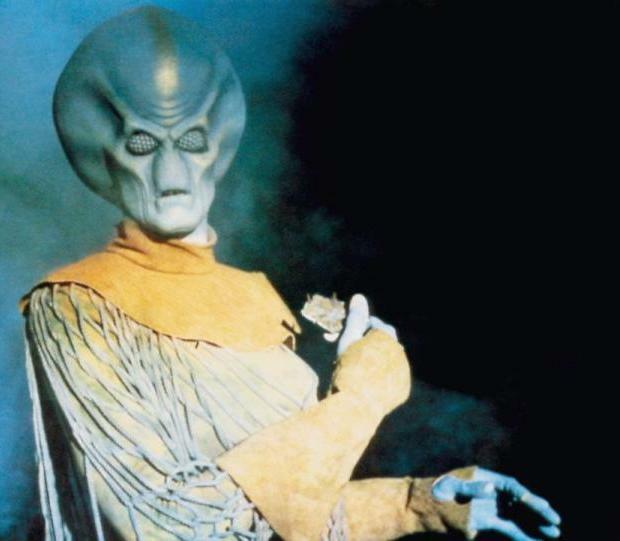 He reveals that Clark essentially took the project over once he got involved and also talks about how Rick Baker ended up designing the alien makeup for the film. The third piece is a brief (six minutes) chat with Greg Cannom. He talks about utilizing Baker’s design and doing the more gore-oriented effects. He also offers some fond memories of Cameron Mitchell and Kevin Peter Hall, both of whom he befriended on this shoot. The last featurette is a 15-minute chat with Cundey, who worked with Clark several times during the early phase of his career. He reveals that he did the film in spite of advice from others to stop doing low-budget work because of his friendship with Clark. He also talks about the production’s visual challenges and the techniques he used in shooting night scenes on a tiny budget. The disc is rounded by a quick set of promotional materials. There is a theatrical trailer that presents the film in an effective horror/rollercoaster style and also utilizes the original title, It Came Without Warning. Next up is a still gallery that features around 20 black & white and color stills plus posters that represent both of the film’s titles. As a final bonus, Scream Factory throws in a “more from” trailer gallery that includes some thematically appropriate trailers for some other releases on this label: Dark Angel has a similar premise to Without Warning while Motel Hell and Schizoid were both released in 1980, the same year as Without Warning. In short, this is another tidy little special edition from Scream Factory. Anyone charmed by the way this company will lavish attention on smaller, forgotten titles will appreciate their labors here. To read Schlockmania’s film review of Without Warning, click here.